Law & Order: Criminal Intent fans we’ve got a contest for you! To celebrate the upcoming season which premieres Sunday, May 1st at 9/8c on USA, we’ve got an amazing prize pack full of DVDs, t-shirts and more! The final season of LAW & ORDER: CRIMINAL INTENT premieres on Sunday, May 1st at 9/8c on USA, featuring the long-anticipated return of Detectives Goren (D’Onofrio) and Eames (Erbe) to the Major Case Squad. Terminated for insubordination a year ago, Detective Robert Goren has been reunited with his long-time partner Alex Eames at the behest of new Major Case Captain William Hannah. In addition to plunging into colorful, dangerous mysteries, Goren has mandatory sessions with brilliant police psychologist Robyn Widrow thatwill ultimately help him unravel his tortured past. It’s pretty simple. You need to watch the the first episode and either tweet me (TiffanyDEmidio) or email me (tdemidio at eclipsemagazine dot com) something specific that happens from the show. A winner will be chosen Friday, May 6th. **This contest is open to residents of the U.S and Canada and is courtesy of USA Network. It’s valued to be $110. Once a winner has been chosen it may take 6-8 weeks to arrive. USA Network unveils its new Monday night programming block with the premiere of WWE TOUGH ENOUGH on Monday, April 4th at 11:05/10:05c immediately following RAW. Hosted by WWE Hall of Famer “Stone Cold” Steve Austin, with joined by trainers and WWE superstars Trish Stratus, Booker T and Bill Demott, WWE TOUGH ENOUGH will feature a group of twelve individuals looking for an once-in-a-lifetime shot to become the next WWE Superstar or Diva, the grand-prize winner will be awarded a contract with WWE, joining its roster of talent. WWE TOUGH ENOUGH will premiere at 11:05/10:05c immediately following WWE MONDAY NIGHT RAW and then will move into its regularly scheduled timeslot, Mondays at 8/7c, starting on Monday, April 11. It’s pretty simple. You need to watch the the first episode and either tweet me (TiffanyDEmidio) or email me (tdemidio at eclipsemagazine dot com) something specific that happens from the show. A winner will be chosen Friday, April 8th. ** This contest is open to residents of the U.S and Canada. 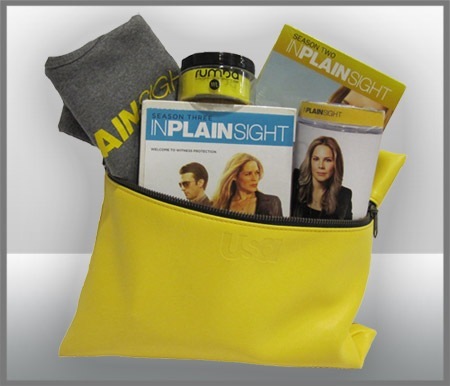 The prize pack is courtesy of USA Network and is worth $149.99. It is important to note that prizes may take 6-8 weeks to arrive. Enter to Win a FAIRLY LEGAL Gift Bag! Starting this January 20th, don’t go to court, go to Kate. On Thursday, January 20th at 10/9c, USA Network brings you the premiere of its newest series, Fairly Legal. Once a lawyer at her family’s firm, Kate Reed’s frustration with the legal system led her to a new career as a mediator. Thanks to her understanding of human nature, thorough legal knowledge and wry sense of humor, she’s a natural at resolving disputes … except when it comes to her own. Fairly Legal stars Sarah Shahi, Michael Trucco, Baron Vaughn and Virginia Williams. Visit the official website for games, exclusive content and more at http://www.usanetwork.com/series/fairlylegal/ and don’t forget to become a fan on Facebook at http://www.facebook.com/fairlylegal. Enter to Win a Royal Pains Gift Bag! Enter to Win a WHITE COLLAR Gift Bag! Tuesday, January 18th, USA Network is bringing you the premiere of all new episode of White Collar at 10/9c! Find out what happens to Neal, Peter, Mozzie and the rest of the crew after a huge cliff-hanging finale last summer. WHITE COLLAR stars Matt Bomer, TimDeKay, Tiffany Thieseen, Willie Garson, Marsha Thomason and Shariff Atkins. Visit the official White Collar website at http://www.usanetwork.com/series/whitecollar/, for games, photos, videos and weekly prizes. Become a fan on Facebook for the latest news, exclusive features and more at http://www.facebook.com/whitecollar.